A small service that I was in at the last conference. I was not able to arrange schedules to be at the conference in the Philippines this year where I had been invited to speak again so I got the reports second hand. One of the stories that I was told when I was talking with the children yesterday was about the youth project at the conference. Each year, the youth come up with a project to help in the community where the conference is held. This year, they decided to help some of the housebound and ill people that they had been told about. In the weeks leading up to the conference, the church leaders in Dipolog got together a list of names of people that fit the criteria. 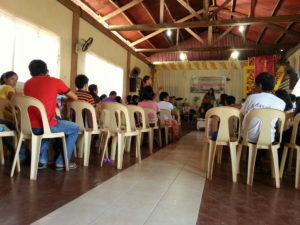 The first day of the conference, the youth assembled baskets containing some personal care supplies, treats, and other welcome items as well as some flowers. In one of the boxes that I had sent, I had included a box of tracts and booklets from the World Missionary Press in New Paris, Indiana. These were in the local dialect. They included one each of the tracts and booklets in each basket. The adult chaperones divided into several groups and were able to distribute the baskets to everyone on the list. I was told that the baskets were greatly appreciated, which is understandable since the Philippines does not have the safety net for the elderly and ill as we know it here in the USA. The remaining tracts and booklets were passed out at the market area along with the remaining treats to people that they felt would enjoy them. I was able to participate in one of the youth projects when I was there at the last conference and watched the youth that were serving seemed to enjoy it as much as the ones receiving. It is a blessing for them to learn the joy of service as youth. It helps set a Christian outlook for their life, one small step at a time.